This article will look at the amount of sugars found in various fruits and lists the best choices if you are looking to control your intake. How Much Fruit Should I Be Having Each Day? Adults need 2-2.5 servings of fruit each day. This is equivalent to around 2-2.5 cups of whole fresh fruits. According to the most recent Dietary Guidelines for Americans, most adults are not meeting these recommendations. Eating the daily recommended servings of fruit has been shown to improve mental health and decrease risk of cardiovascular disease and mortality rates related to cardiovascular disease and cancer (3, 4, 5, 6). Still, some people are worried about the sugar naturally found in fruit, especially those trying to lose weight or lower their HbA1c. Generally speaking, the sugar in fruit is nothing to worry about though. The beneficial components of fruit far outweigh any potential negatives. Summary: Fruit has many health benefits and should be included as part of a healthy well balanced diet. However, the majority of adults do not eat enough. Aim for at least 2 servings per day. For those looking to limit their sugar intake, some fruits are better than others. Each of the fruits below contain 15 grams of carbohydrates or less per serving and suitable for even those with blood sugar issues. Berries are a delicious and versatile fruit. Strawberries contain only 8 grams of carbohydrates per 100 grams. When eaten as a snack, 1 cup of strawberries has only 49 calories and 3 grams of fiber. If you’re following a low-FODMAP diet, you can enjoy up to 10 strawberries (7). Blackberries provide only 10 grams of carbohydrates per 100 grams. Blackberries are also much higher in fiber, with 1 cup offering 7.6 grams. That’s almost a quarter of the recommended daily fiber intake. These berries are also a great source of vitamin C, an important vitamin for our immune system, collagen formation and wound-healing (8, 9, 10). Raspberries have 12 grams of carbohydrates per 100 grams and are also high in fiber at 6.5 grams per 100 grams. Up to 10 raspberries can be included in a low FODMAP diet (11). All three of these berries are also naturally low in sugar, at no more than 5 grams per 100 grams. That’s just over 1 teaspoon. The great thing about berries is you can do almost anything with them. Add to smoothies or natural Greek yogurt, serve alongside a cheese board, incorporate into your muesli or cereal, or add to your water. Summary: Strawberries, blackberries and raspberries are a great low-carb, low-sugar and high-fiber snack. Melons are a refreshing fruit, especially during hot summer months. They’re also a great low-carb option. Cantaloupe and watermelon both provide only 8 grams of carbohydrates per 100 grams. Honeydew is only slightly more at 9 grams per 100 grams (12, 13, 14). Unlike berries, though, melons generally have less fiber. Each contains less than 1 gram per 100 grams. All melons are a good source of vitamin C and A. Cantaloupe and honeydew are also high in potassium, an important electrolyte (15). Watermelon also has a very high water content, which is great for staying hydrated. Dehydration has many negative health consequences, such as heart and kidney complications, electrolyte imbalances and a drop in blood pressure (16). However, if you’re following a low FODMAP diet, you may want to limit your watermelon intake. Especially if you are sensitive to fructose, fructans and sugar polyols. Opt for up to half a cup of honeydew or cantaloupe instead. Try adding some melon to any of your favorite salad recipes for a surprisingly sweet and tasty twist. Summary: Melons are low in calories and carbohydrates and high in water. They’re also a good source of vitamin A, C and potassium. Low-carb stone fruit options include apricots, cherries, nectarines, peaches and plums. Per 100 grams, each of these stone fruits provides 10-12 grams of carbohydrates. Peaches come in at the lowest (10 grams), while cherries are highest (12 grams) (17, 18). They also yield 10 grams or less of natural sugar per 100 grams. A single serving of a peach or nectarine (150 grams) also provides a modest 2.3 grams of fiber. This added benefit of fiber can have a positive effect on type 2 diabetes and metabolic syndrome by assisting to improve insulin sensitivity and aid in weight loss (19, 20, 21). These stone fruits are a good source of both vitamin C and A. Vitamin A is an important nutrient for eye health and the immune system (22). Stone fruits can sometimes be an issue if you suffer from any FODMAP intolerances. Most contain high amounts of sugar polyols, while nectarines, peaches and cherries are also high in fructans. It’s best to enjoy these fruits when they are in season in the US. Try nectarines, peaches and plums from May to November, and apricots and cherries from May to July. Stone fruits are also a welcome addition to many other dishes. Try lightly grilling slices of these fruits and adding to a salad or incorporate into your morning muesli or porridge. Summary: Stone fruits are low in carbohydrates and high in vitamin A and C and dietary fiber. Part of the citrus family, tangerines are a convenient snack, especially in the winter. They provide only 47 calories and 12 grams of carbohydrates per single serve of fruit (1 medium tangerine). They’re also relatively low in natural sugars at 9.3 grams (23). Tangerines are a source of cryptoxanthin, a type of carotenoid, which is converted to vitamin A in the body. Observational studies have shown the antioxidant effect of carotenoids may be protective against mortality related to cardiovascular disease and some cancers (24, 25). Tangerines can be used in a variety of ways, using either the fresh fruit itself or the skin as a zest. Try adding mandarin slices to a savoury dish or to give extra flavor to your favorite stir fry or pasta recipe. Summary: Tangerines are a good low-carb, high-antioxidant fruit to enjoy during winter. A classic summer favorite, pineapples are surprisingly low in carbohydrates. Pineapples contain only 13 grams of carbohydrates per 100 grams. However, they can be easy to overeat, which can lead to an excess calorie and sugar intake (26). A whole cup of pineapple contains 82 calories and 16 grams of sugar, equivalent to 4 teaspoons. Like all fruits, pineapple is a great source of vitamin C. You can get almost 100 percent of your total recommended daily intake from just 1 cup. Pineapple is also low in FODMAPs, which is good news for those who have sensitivities. Pineapples also contain bromelain. This enzyme has been shown to possess anti-inflammatory properties and may assist in relieving arthritis pain and nasal congestion (27, 28). Try incorporating pineapple into traditionally savoury dishes. You can try pineapple on a hamburger; mixed into salsa; added to a burrito or taco; or in a pineapple slaw served alongside some pulled pork. Summary: Pineapples are a low-carb, low-FODMAP fruit that contain anti-inflammatory properties. If you’re curious about what other fruits are low carb, low sugar, below is a summary of many different varieties. 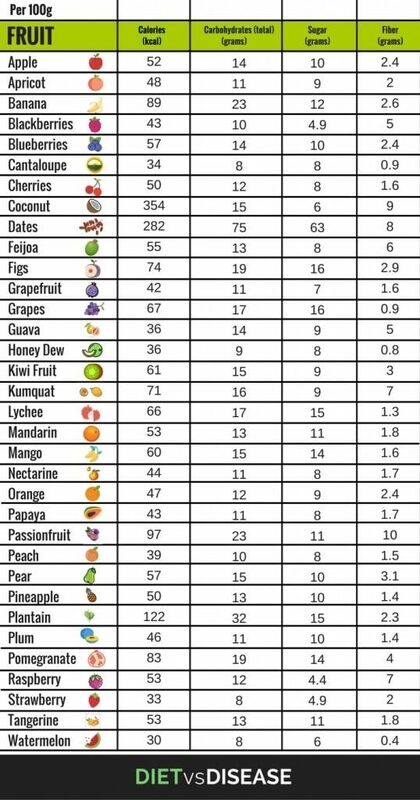 All fruits are listed per 100 grams. Remember to keep in mind how much you are eating in one sitting, or throughout the day. Try to stick to the 2-2.5 cups of fruit per day recommendation. There is no need to fear fruit. If you’re watching your weight or managing diabetes, there are plenty of low-carb options available. These include berries, melons, stones fruits, tangerines and pineapple. Many fruits are also high in vital nutrients like fiber, antioxidants, vitamins and minerals, so you should aim to have at least two pieces of fruit (equal to 150 grams or 1 cup) per day. Try to include mostly fresh fruit in your diet and avoid processed, sugary fruit juices. Consider these options too if you are diabetic. Remember, fruit doesn’t always have to be eaten as a solo snack. Try adding it to smoothies, drinks, salads and various savory dishes.